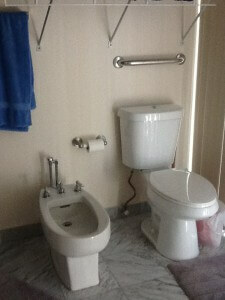 As promised in the taco meatloaf entry, I will tell you about the bidet in our condo. More specifically, I will tell you how I got hit in the face by the water from the bidet. Michael came out to Miami two months before Averi and I, for a variety of reasons. One of the most important reasons was to find a place for us to live. After an exhausting search (I know, I still owe you the realtor story), he found us this place. It is surprisingly large by Miami standards, at around 1500 square feet. And it’s even laid out well, with space for our dining room table (yes, that that is now how I judge if a home is large). But, in my opinion, too much space was given to the master bath. It has a separate shower and bathtub, the toilet, tons of open space, and the bidet. Because all good Trophy Wives need a bidet in their home. We’ve never actually used the bidet. Unless you consider Averi putting her Barbies in the “pool” as using it. If you do, it’s been used. Anyways. I had already turned on the bidet taps when I noticed that the drain was closed. So I leaned over the bidet to open the drain. Except I didn’t open the drain. I turned on the fountain/jet/gusher thingy. And nailed myself in the face. And got the ceiling, the walls, and the shower door behind me. That thing has serious water pressure. So serious that even if I had started thinking about using the bidet, that cured me of it. I have no interest in levitating in my bathroom. And that is the story of the bidet in my condo. Hopefully there will be no need for you to ever hear about it again. I have no idea how to transition from that story to talking about the quinoa dish I made for dish dinner. As Averi likes to say “awkward”. So I’ve decided to just write as if I hadn’t written anything else yet. Starting fresh, if you will. Which is funny cause I was talking about bidets. As mentioned in the lime and quinoa entry , I judge grocery stores by the price of red peppers. And Presidente has them on sale for 75 cents each this week. I picked up two, cause how could you not at 75 cents each. So today I decided to use the red peppers to make this quinoa dish that I love. I always have the right ingredients for it, because essentially anything works as long as you have the quinoa, but I really love it with red peppers. As you can see from the picture, I watched the final episode of That 70s Show while preparing this. It was good, but I have many unanswered questions. Are Eric and Donna together? Did Fez ever say his real name or where he’s from? And most importantly, what should I watch next? Advise me, people. When I was taking the above pic, I was thinking it looked nice, but that it was a lot of red. Luckily I remembered I had other items to add. 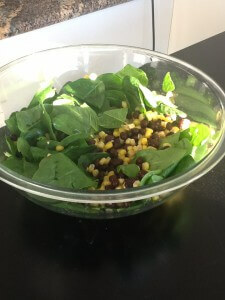 I also added some black beans, canned corn and spinach, cause I had them too. I also added some really good chorizo sausage to this to make a complete meal, but you can eat as side dish or with the protein of your choice. 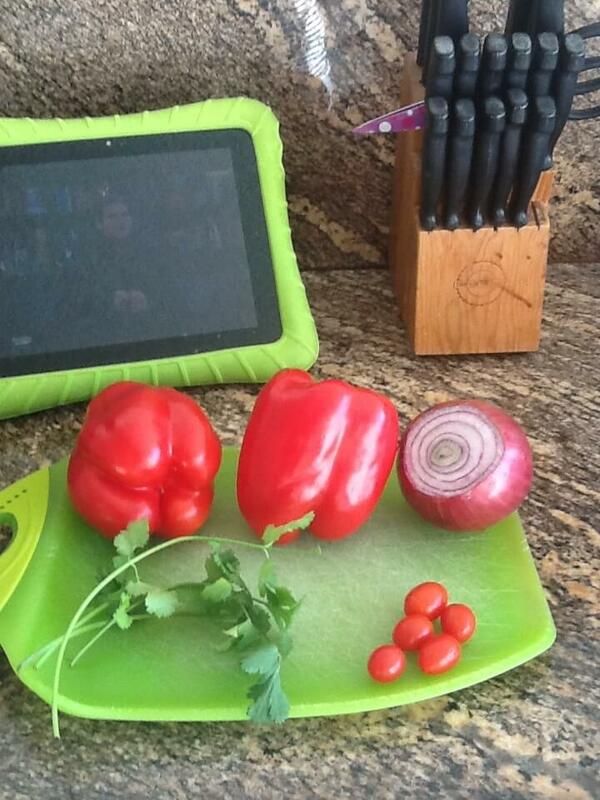 So remember, let me know what show to watch on Netflix net, and I hope you find red peppers on sale. Prepare quinoa according to directions. As mentioned previously, I like to use soup broth instead of water to make quinoa more flavorful. Let quinoa cool. While cooling, combine red pepper, red onion, tomatoes, black beans, corn and spinach in a bowl. 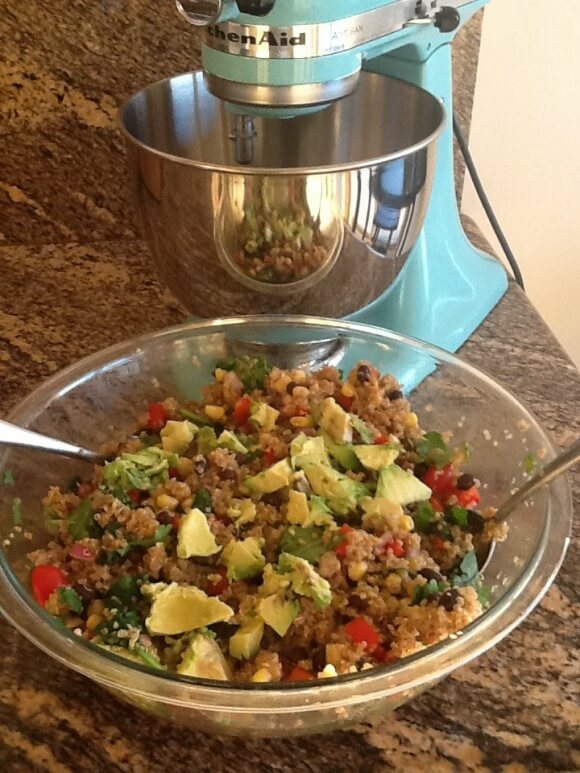 When quinoa is ready add to bowl of red pepper ingredients. Mix well. 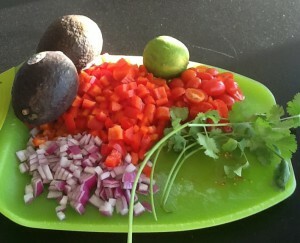 Then add cilantro, lime juice and avocado. Mix carefully. Then enjoy!